Gas Innovations highlights surge in US ethane supply. As anyone following the oil and gas market in the US knows, ethane is now plentiful and available at economical prices. The sudden growth in US shale gas development has brought an equally dramatic surge in supply of natural gas liquids, and ethane is far and away the least expensive and most abundant natural gas liquid found in the relatively ‘wet’ shale-sourced gas. Not too many years ago, companies were shutting their cracker plants in the US because of the high cost of naphtha. That was before technological advances in shale development made it possible to produce oil and natural gas liquids, most notably ethane, at a very competitive cost. Today, additional drilling areas are being discovered both in ‘old’ plays such at the Permian and in relatively new ones such as the Marcellus, Eagle Ford, and Bakken plays, not to mention new formations being found under longknown formations. The US is blessed in hydrocarbons, and it now has the technological capability to produce them economically, without having to depend on oil from elsewhere in the world. This position of abundance looks even better when you consider that its neighbours to the north are also rich in hydrocarbons and neighbours to the south have opened their hydrocarbon opportunities to private investment. What will soak up excess supply? Today we find a huge imbalance between available ethane and the usage market, with more ethane available than can be used. Billions of capital-expenditure dollars are being spent to build ethane crackers (to make ethylene); seven are under construction in the Gulf Coast area and more have been announced. Ethane’s principal value still lies in its global use as a petrochemical feedstock, and that will no doubt soak up some of the excess ethane, especially as exporting and importing infrastructure develops, petrochemical plants switch to ethane from competing feedstocks, and the price of ethane (including shipping costs) remains low. Large new ethane ships – VLEC (Very Large Ethane Carriers) – have been built, some are now being built, and some have already been deployed to move ethane from the US to Europe and other regions to produce plastics. Yet petrochemical feedstock is not the only application that can help take up the excess. Other users and applications are there to be developed or better served. From its inception in 2002, Gas Innovations, headquartered in La Porte, Texas, has met its goal of serving industrial gas producers and distributors as a dependable, independent wholesale supply partner. Since its founding, the company has grown to become a worldwide supplier of high-purity hydrocarbons, refrigerant gases, and specialty gases, as well as related equipment and technical expertise. At its main facility near the Houston Ship Channel, the company maintains its liquefied petroleum gas plant, inventories of approximately 100,000 gallons, and an analytical laboratory that certifies all specialty gas products. The refrigerants market is in its infancy in some aspects, with substantial growth expected in future years. LNG plants are starting to be built again, and the liquefaction technology is such that ethane is a preferred refrigerant in some cases because of its being part of NGLs in the event of leaks. Typically, large amounts are needed for start-ups and black starts, or in the event of leaks when the plant does not have the capability to produce its own ethane. Ethane is also used as a replacement for such refrigerants as R23 and R508B. It is viewed as a naturally occurring refrigerant that reduces ozone depletion and global warming compared with typical refrigerants made of chlorofluorocarbons (CFCs), hydrofluorocarbons (HFCs), or hydrochlorofluorocarbons (HCFCs). The specialty gases segment had grown over previous years, but over the past year it has been stifled by the disappearance of a prime source of ethane supply, which has forced customers and potential customers to seek alternative products or to shelve their projects until suitable supply is available. Within the overall ethane specialty market, the BTU supply (fuel) segment offers by far the largest growth potential and the best opportunity for suppliers. The biggest opportunity for growth is in power generation, where the pricing and BTU content of ethane compete favourably with LNG. Ethane has a higher heat value than propane and produces far less emissions than crude oil or coal. Some of the new ethane ships (the VLEC) can also burn their cargo as fuel. As noted earlier, the specialty market requires specialty packages, as well as specialty loading equipment and extensive knowledge and expertise in handling cryogenics, liquefied gases, and highpressure gases. Gas Innovations provides the following lists of requirements. Complete understanding of each package being filled (DOT requirements/container requirements). Ships – LPG, ethane, LNG. Ethane customers that start out small, prove technology, and then move into larger volumes requiring larger packages, pipelines, or plants have up until now been stymied. This developmental-stage market had been stagnated because of a lack of supply, both in the form of continuity and in the composition of supply (cryogenic, liquefied compressed). 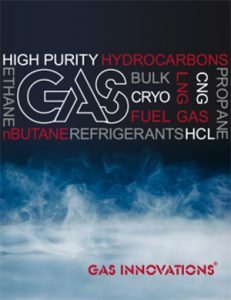 In July 2017, Gas Innovations revealed its new venture into the cryogenic ethane business and executed a truck loading agreement with Sunoco Logistics. By September, the company began providing truckload quantities of high-purity cryogenic ethane from Sunoco LP in Marcus Hook, the first such facility to load liquid ethane onto tanker trucks for local delivery.